Having a cold glass of tea when it's hot outside is heaven in itself. But one which has tapioca bubbles (sabudana, basically) that you can burst in your mouth? 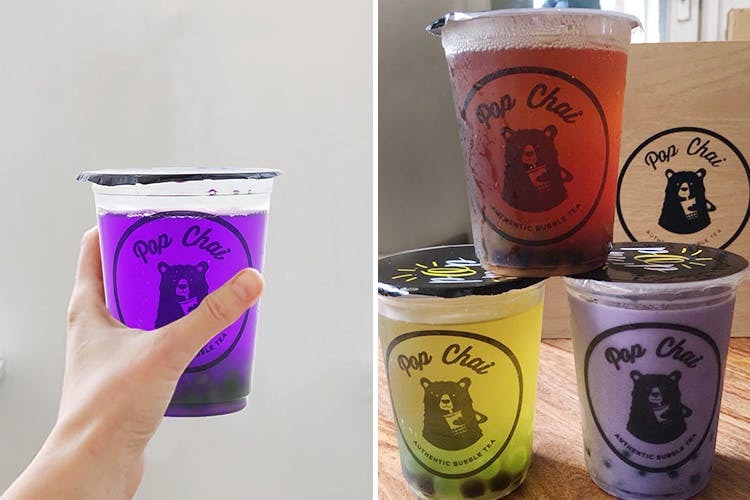 We say, try one yourself from Pop Chai which does refreshing, fruity bubble tea. If you’re someone who LOVES popping bubble wrap, this tea will give you the same kind of satisfaction. People with a strong sweet tooth are going to love this. You can choose a flavour for a fruit-based or a milk-based tea, as well as for the poppers and jellies (they’ll even warm it up for you, if that’s what you prefer).Weight-watchers, you can get the sugar in the drink replaced with honey (for an additional cost). We tried the milk-based blueberry one and weren't too impressed—too sweet. The water ones fared much, much better. Also, the prices are a bit on the higher side. Ask them beforehand to know which flavour tea goes well with which popper and jelly. We tried a strawberry one with pomegranate poppers and pineapple jellies and a passion fruit bubble tea with orange,kiwi and green apple poppers with litchi jellies and they were YUM. Also a heads up, they're opening a new outlet in the DLF Mall of India on July 14th (More good on you, Noida).